This week it’s all about ROOKIE MINI-CAMP! This past weekend I spent the majority of my time following around a bunch of excited rookies at the Colts complex. After they arrived at the complex and finished all of their paperwork, they were guided over to yours truly for their official headshot. I set up my make-shift photo studio in the Colts Pavilion (where the players and staff eat) so no one would have any excuses about how they couldn’t find me to get their photo taken. Due to my convenient location, I was able to also shoot 40 Colts staff headshots in my down time between player headshots. I shot both a traditional headshot that the NFL uses and a more creative headshot that the Colts use for marketing purposes. Each player spent a total of two minutes with me, just enough time to ID them and shoot a few images in two different lighting setups. As you can see in the photo gallery, the lighting setup for the different headshots were quite different. I used a total of seven lights setup on two different triggering frequencies to achieve the dramatically different looks before they knew what hit them! The rest of my time was spent on the practice field capturing them in action. Overall, I had a great weekend following around some very talented football players doing what I love to do. For me, it doesn’t get much better than that! Pete Prisco of CBS Sports compiled an interesting list earlier this week when he ranked the top 10 players in the NFL under the age of 23. Last year’s top two picks Andrew Luck and Robert Griffin III missed the cut off at the age of 23 but the Colts did find themselves represented on the list. Check out Prisco’s top-10 list here and his analysis on the Colts representative. 10. Vick Ballard, RB, Indianapolis Colts — As a rookie fifth-round pick in 2012, he ran for 814 yards and showed a powerful running style. He will get even more carries in 2013 as he takes over as the starter (Prisco). Bowen’s Take: To many Colts fans it might come as a surprise that Ballard’s name finds this list. Sure, Ballard had a tremendous rookie campaign but consider that he’s the lone player on Prisco’s list that wasn’t a first or second round selection out of college. (Josh Gordon was a supplemental selection of the Browns and Cleveland eventually forfeited a second round selection in the 2013 NFL Draft). The list includes just three skill position players and they all come from the AFC in Trent Richardson, Gordon and Ballard. Along with Luck, both Dwayne Allen and T.Y. Hilton fall in the 23-year old age group. It’s nice to see a player like Ballard gain some national recognition after a season in which he (understandably) flew under the radar thanks to his fellow rookie teammates. For those curious, Ballard will turn 23 years old on July 16th. COULD ANOTHER LINDENWOOD PROSPECT HELP THE COLTS TO A SUPER BOWL? Denodus O’Bryant had just four carries during a redshirt freshman game against Central Methodist but he didn’t need any more to prove a point. A total of 119 yards were gained on those four touches and Central Methodist defensive coordinator Jody Ford had seen enough. Now, four years later O’Bryant does find himself in the league after he leaves Lindenwood (a former NAIA program) as the school’s all-time leader in rushing yards (3,327) and touchdowns (62). The Colts were quick to pounce on O’Bryant as the 194-pound back went undrafted following a career at Lindenwood where he averaged 7.2 yards per rush and also 31.3 yards per kick return. For some Colts fans, the name Lindenwood might be familiar when thinking back to the Super Bowl XLI season. 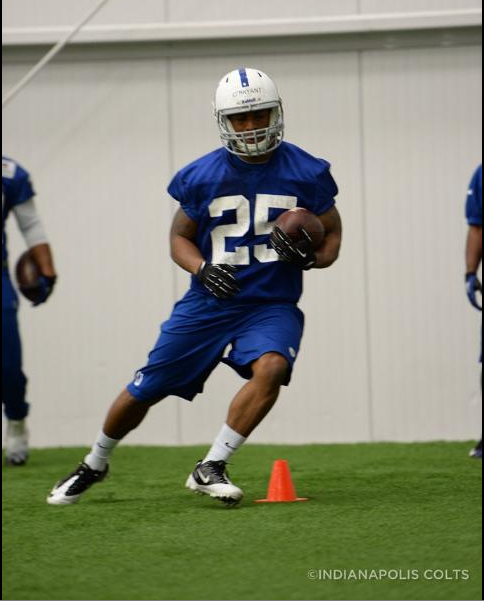 Back in 2006, running back DeDe Dorsey played in 13 games for the Colts and his name still resonates at Lindenwood. “I’ve met him a few times,” O’Bryant said of Dorsey, the single season leading rusher at Lindenwood. Any mention of a Super Bowl XLI ring? “He flaunts it,” O’Bryant said with a smile. That is the eventual goal for O’Bryant but here and now it’s all about finding a roster spot in the same fashion that Dorsey did seven years ago. O’Bryant wrapped up his first weekend in the NFL on Sunday and with the close of rookie minicamp comes the return of OTAs, with a little influx from some first-year players. The next month, along with training camp, will be the time for O’Bryant to show the type of back that made opponents fret for the last four seasons. “I’m a real diverse kind of back because I’m 200 pounds,” O’Bryant said. Denodus O’Bryant goes through running back drills at last weekend’s rookie minicamp.